Last week a country-club Republican friend in Palm Beach gave me a copy of The Weekly Standard and urged me to read “A World in Crisis: What the thirties tell us about today” by opinion editor Matthew Continetti. The article would have the reader believe that the universe’s fate hinged upon a little-known 1931 Manhattan traffic accident involving Winston Churchill. Churchill was crossing Fifth Avenue at 76th Street in the late evening of December 13th, 1931 on his way to Bernard Baruch’s apartment for a powwow when he looked the wrong way, crossed against the light, and was sideswiped by a car going 30MPH. The hapless statesman spent over a week in Lenox Hill Hospital recovering from a sprained shoulder, facial lacerations, and a mild concussion, all of which required a doctor’s prescription for “alcoholic spirits especially at meal times.” Continetti mentions “the granularity of history,” whatever that means: “If the car had been traveling just a little bit faster, the history of the twentieth century would have been irrevocably altered.” True enough, but for the better or the worse? Continetti would argue that this chance mishap worked out for the best. His premise is that the 1930s were dangerous times much like our own, and it took the astute Winston Churchill to come to humanity’s rescue and make things right: “A few people in December 1931 recognized the growing danger. The patient at Lenox Hill Hospital was one.” Oh, dear. What bilge. The Weekly Standard, as well as National Review Online and Commentary Magazine, all belong to the same faux-conservative neocon fraternity which hijacked Washington starting with H. W. Bush in the Cold War’s aftermath and has demolished any hope of a “peace dividend” ever since. Fighting fire with gasoline is not generally a good idea, and Islamic extremism is a logical byproduct of the Tel Aviv-Washington alliance. Hence, the slow-motion downfall of the world’s “indispensable nation” is now upon us. It reminds me of the sad state of Little England in WWII’s aftermath, all thanks to Sir Winston’s myopic leadership. Neocon opportunists have grabbed Churchill as one of their own. He is always linked to the presumed “good war” and has been glorified to the skies as a result. But what if that car had been traveling faster down Fifth Avenue in 1931 and knocked the British bulldog into the next world? Could the Second World War have been avoided altogether? The “good war” resulted in approximately fifty million fatalities worldwide, left Europe a starved and blasted continent, destroyed the far-flung British and French empires, brought the Soviets into Europe’s heart for more than forty years, and handed China over to Mao Tse-tung. 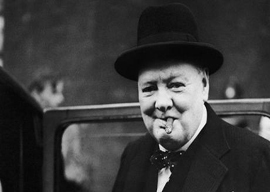 Churchill actively participated in making World War II a global conflict. He promoted war’s outbreak in Europe in the summer of 1939, utilizing the Versailles Treaty’s last unresolved issue: Danzig and the Polish Corridor. Prime Minister Chamberlain gave Poland a blanket guarantee of the status quo, terminating a negotiated settlement and making war between Berlin and Warsaw inevitable. In 1941, Churchill withheld vital information from the Hawaiian commanders about an imminent outbreak of hostilities. London’s Far East code-breakers had cracked the Japanese naval code, JN-25, and Churchill had access to it. The “surprise” attack on Pearl Harbor turned the European conflict into a truly global war. It was Pearl Harbor that saved Churchill’s backside and rescued the Roosevelt presidency.